Will Jay, the National Forest Adventure Farm’s Livestock Team Leader, is responsible for the care, feeding, nutrition and health of all the animals on the Farm. He will be overseeing the lambing of the 78 ewes this February. Here’s an insight in to what’s involved. We plan to have ewes giving birth during the school holidays in February and at Easter. The gestation period for a sheep in about 147 days so we work backwards and make sure that tups (rams) are in with the ewes at the correct time. The tups wear a special harness that marks a ewe so we know whether the sheep is likely to be pregnant or not. By changing the colour of the mark every 2 weeks we can have a good guess on when the lambs are due. We scan the ewes at about 80 to 90 days to see not only if there are pregnant but how many lambs they are carrying. We mark them with different colour to show if they are pregnant with one (blue), two (no mark) or three (green) lambs. About four to six weeks before the lambs are due, we bring the ewes in to our Lambing Live tent. Lowland sheep do need a bit more maternity care than highland sheep and bringing them in means we can monitor their health and nutrition. For example, if we know a particular sheep is carrying triplets, we make sure she gets enough feed. When the lambs are due, we monitor the ewes regularly including through the night. Most ewes will give birth unaided but in some cases we have to intervene including when a lamb is breach or has its legs and head facing backwards. You may have seen farmers rubbing a new born lamb with straw. This helps stimulate breathing after a difficult birth. Ewes can only feed two lambs effectively so in the case of triplets one has to be taken away. After the lamb has had its important colostrum milk, we either try to get a ewe with only one lamb to ‘wet adopt’ it or house the lamb with other triplets. We have an on-demand milk feeding machine which supplies formula milk whenever a lamb needs it. 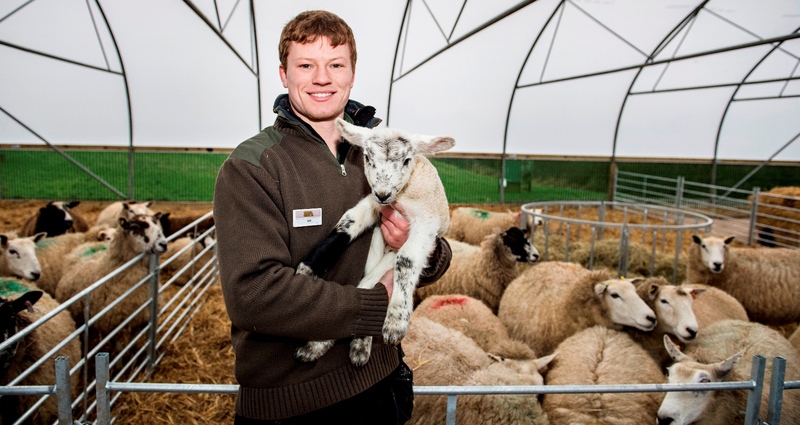 The ewes and lambs will be kept in our Lambing Live tent and moved to the ‘nursery’ area until there is enough grass in the fields to feed them.